Does size matter? Or is it shape? Or room? As October faded into November I found myself giving talks at the fabulous TELLSI conference in Mashad, Iran, immediately followed by a stint at the IGA conference (Instituto Guatamalteco-Americano) in Guatemala City, and then MEXTESOL in Queretero, Mexico. That was special because it was the organisation’s 40th anniversary, and I have to admit (proudly, come on, proudly!) that I spoke at MEXTESOL’s first ever conference in Tampico all those years ago. 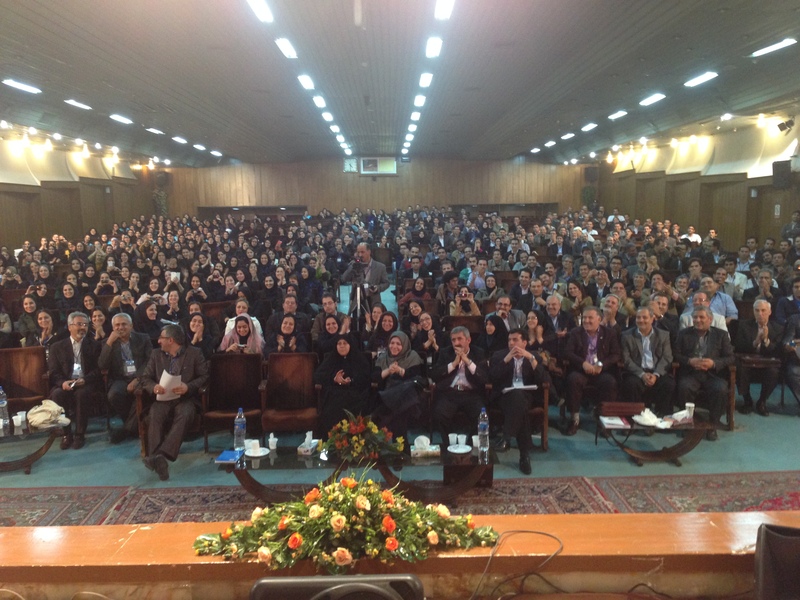 Perhaps the most interesting of the three conferences was the one in Iran. Why? Well because it’s not so easy to get to Iran right now (though it may, InshAllah, get easier soon if our governments talk more to each other). But the conference was beautifully organised, the welcome was effusive and the standard of presentations was terrifically high. I found myself wishing that there had been more international visitors listening to the riches that Iranian ELT has to offer. The thing is, I find it much much more difficult to animate one of those ‘sideways-on’ rooms than a long vertical one, and I wondered whether there is something wrong with me! But all the walking from side to side is sooo tiring (maybe I should stay still)! With a full-length room you can still feel like you are talking to the back of the room, but in a sideways-on room I always feel as if some people (especially in the front rows) are far far away. Rooms like that never get so engaged (I think) as vertical rooms. Or is it just me? Or are there other things going on? For example, I reckon the acoustics make or break a presentation. I was in a large room with echo-ey acoustics in Montevideo a few weeks ago and I couldn’t understand a word the speaker said (but that might have been my Spanish!). Is the distance of the stage from the audience a factor (if you can’t get down to the audience level)? Or is the deciding factor (for success./engagement etc) the amount of available space? 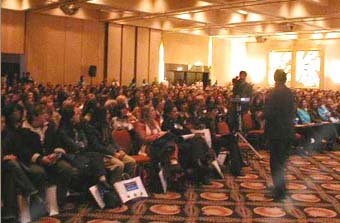 Do you prefer (both as speaker and participant) a crowded or nearly empty space? If YOU were designing a new conference space how would you design it? When you go to a presentation where do YOU like the speaker to be? If you are a frequent presenter, what’s your favourite and least favourite space? I’d be fascinated to hear your views. ← Would you like to be a ghostwriter? Thanks for commenting. I think I agree with you about preferring the ‘Iran-shape’ room. But I am a bit bad at walking around. I think I ned to stay still more often! I was there when you came to HCT Muscat two years ago for a presentation sponsored by British Council, and when you came last month again to Muscat (Middle East College) I sent my regards to you through a friend of mine and she told me she conveyed it to you:-)). What I like most about your presentation is, you always try to engage the participants. I believe, your walking around is one of the factors that help to engage the participants. I completely agree with your assessment regarding the horizontally full rooms. It mimics the same issue with classrooms that are only a few rows deep by wide, in that you always feel as though you’re not directly addressing those on your sides. In these cases, I tend to pick a front corner and address everyone in an angular fashion. I went to a rather peculiarly shaped room at TESL Canada last November in Kamloops. The room was 360, with the presenter down in the middle, somewhat resembling a Roman (or at least ancient) type of stadium (http://twitpic.com/dlrqbs – bigger than it looks). I found this very spectacular at first, but once in the session, realised that the presenter, Penny Ur in this case, only faced one direction predominantly and therefore no one wanted to sit behind her. For me, I’d go for the large convex theatre room with graduated seating facing forward. Luke & Lindsay’s plenary from TOSCON13 was in a room like this. Everyone could see easily, acoustics were good and they could move around the stage area quite easily (provided they had a wireless mic too). It seems like such a good idea in theory to have a theater in the round, but the constant having to turn around would be awful. And if you wanted any kind of writing surface, you’d have to keep turnint it wouldn’t you. Interesting reflection and if we stop and think the size and the layout of a room does indeed make a difference to the dynamics of a presention, talk, plenary etc. My ideal conference space, if I could design that space, would be sort of like a theatre-in-the-round space (arena theatre or central staging space). The audience would have at least 4 entrance/exit routes, which the speaker could also use to get close to the audience, and the speaker could be on a stage, slightly above the audience, or the stage could be floor level, with an upward incline for the seating. So, where would the screen be for the possible power point presentation? Ideally, no power point…so no need for the screens….but being less radical, the screens could hang from the central “stage” area, facing each of the audience segments. But the good thing about this is that the speaker can get closer to the audience, the experience of the talk is so very different, so much more involving…more intimate in a way, even if the audience is bigger, but it does require good communication skills on the part of the speaker..which is fine considering we are all teachers I suppose. But I am not sure how many people would feel happy about this…it does require a 360° approach towards the audience on the part of the speaker and this could be quite tricky. But it would be different. thanks so much for coming along and commenting. I replied to Tyson (above) about ‘in the round’ rooms. I think my reaction in Mexico, then, was that because the walls of the circle was so high I had to spend my time looking up and around! It did feel a bit like a Roman arena, and I waited for the audience/teachers to decide whether to give me the ‘thumbs up’ or ‘thumbs down’. I mean more than usual! But the idea of an audience in the round, not to highly banked, with different entrances and exits…well that would be fun. And yes, as a recent convert to technology-free presentations (sometimes), your proposal sounds interesting. Interesting because as a teacher I prefer sideways layouts because the back of the room is not as far away as long thin rooms. On the other hand, some students prefer to hide in the back (myself included) because it feels safer. I went to a lecture once with a very kinesthetic speaker. She had us doing a lot of hand gestures and turning to partners and saying silly things. For someone who takes themselves as seriously as I do, it was sort of embarrassing. Had I been in the back of the room where no one could see me, I’d have been happy to play along, however! thanks for your interesting comments. Your Kinaesthetic teacher didn’t worry about shape too much, I guess. She was more interested in your involvement? But the back row does give you a bit of safety. And sometimes disconnection? As a student, I do not have that much experience in presentation of course, but I believe setting plays a significant role. It can be stressful or not, just because of the shape of a room or even its color! In my opinion, giving presentation in an oblong room is difficult as you have to constantly walk from one side to the other to make eye contact with the audience. Actually It is distracting. I myself prefer semicircle room without those bumpy stages. Giving presentation in front of a large audience is itself stressful (at least for novice people) and it is accelerated by standing on the floor. As a student, I do not have that much experience in presentation of course, but I believe setting plays a significant role. It can be stressful or not, just because of the shape of a room or even its color. I’m sorry we didn’t meet up in Mashad! Thank you for reminding that the appearance of a room may be as important as its shape. Studies have shown how colour affects moods etc. Don’t the same principles apply as for any person-person communication? You and your audience will respond best when more people feel that they are getting your talk directly face-to-face. People like to feel that you are speaking to them more than that they are watching a great speaker from the side, top, back or wherever. That’s why the longer room works better than wider rooms and why rounds etc don’t work so well for this sort of talk and have generally been less popular for theatres. Of course, this also means that acoustics and being able to see the speaker clearly are crucial. And no, I am not suggesting that you should necessarily shave your beard off, especially with Christmas just round the corner. It was an honor of mine to have the chance to be one of the audiences of your great TELLSI plenary. It was a nice presentation and I enjoyed a lot. I hope to meet you next year and more often. I think It is easier now since the Iranian committee have met agreements with p5+1. But about the shape, I should tell you that all Iranian presentations theaters are like this (I mean vertical and frontal). As a listener I do prefer this style and most of the time a still presenter. But you were different, moving side by side but not in way to distract anything or anyone. I also liked the two projection screen, one for the slides and the other helped me a lot to have you and others from many different views. It is also better to be nearer to the presenter. An aisle, in the theater so that the presenter (If he or she wants) can be able to walk around and engage and involve the audience, is necessary but actually we didn’t have something like this in TELLSI. Oh! But about your slides as you mentioned to tell you about your PowerPoint slides in “10 things I hate about PowerPoint”. It was a brilliant job. The pictures (The Omar Khayyam graveyard and Suresh’s presentation) helped a lot. Different medias like the music clip and also your weblog (that exactly I was watching your presentation and after you talked about that comment in your weblog I had searched and found you) and no bullet points :D! But No sound effects! A question! Isn’t it hard the way you always handle that mouse or controller up near the microphone??? You know, I have my own blog writing my diaries and thoughts about teaching but in Farsi. http://www.misrule.blogfa.com . But you’d really motivated me to change it to English! thank you so much for your kind comments. I had a great time at TELLSI, my first (of many, I hope) visits to Iran. There’s no mouse/microphone problem that i know about…. Until you said it I hadn’t realised how much I, also, like having those two screens in the theatre at the conference. So I could read the presenter’s slides and, at the same time, get a good clear view of them as they presented. Congratulations on your blog. I don’t think I’ll get very far with it (in Farsi) so I’ll wait till it is i English!! It was really nice hearing from you. Iranians,among whom I am one, have a proverb : “That’s the listener who inspires the speaker”. Although immediate physical setting could not be overlooked , my culturally oriented mind prefers to define the phenomenon in terms of the audience and the culture. Culture seems to have some effect on the architecture . Religious(holy) places like mosques, churches, and … are and have been presentation rooms actually . A closer look at these places will feed us with some insights on how the listeners are used to listen. Sry to leave the topic incomplete actually I’, a dead body on feet at 2:30 AM from Iran. By the way, I have a tooth for cross cultural studies , the topic sound research worthy . thank you for leaving your comments. I am sorry I didn’t reply earlier. Yes, yes, yes! The listener inspires the speaker! There is nothing as welcoming as an audience that WANTS you to be ‘good’. The atmosphere in the room, the sense of occasion etc – all that is SO important. You make a very good comment about churches and mosques – well, and from a few hundred years ago etc – theatres etc. People knew how to work in (in those days) unamplified spaces. Maybe there are clues there. Cross cultural studies? I wish I had more time! as a presenter at IATEFL Harrogate, I found myself giving my workshop in Hall Qa. This was not a room at all, but a temporarily partitioned-off corner of a large exhibition hall without even a door. Everything said in the other partitioned-off “rooms” in Hall Q could be heard in the adjacent ones, which distracted both me and my audience. My PPT included video clips of oral exams, and it was unfortunate that my audience could not see them very well either, because the strip lighting in the ceiling of the hall could not be dimmed or turned off just for me, making the projected picture much too pale. I do realise that the conference organisers have to make the most of what the venue can provide and cannot give each and every presenter a perfect room, so I am not saying this in order to complain. My point is that first-time presenter (especially if they are also being filmed, as I was) can easily be put off by this kind of drawback. BTW the room was longer than wide, so at least that part of it was fine!